Bask in the glow of the outdoor fireplace. Let the soothing bubbles of the hot tub tame your tensions. Smoky mountain adventures are minutes away, but why would you want to leave? 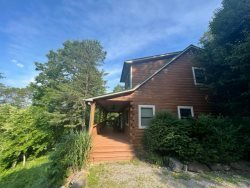 This 3 bedroom, 3 bath upscale vacation cabin has a gorgeous view and is centrally located for outdoor adventure. The first bedroom on the main floor has a King bed. The second bedroom on the main floor has a Queen bed and a built in bunk bed of two Twins. The third bedroom is upstairs and has a King bed and private bath. Beautifully appointed and outfitted with two walk-in tiled showers. Minutes from kayaking and rafting, Morning View Over Lake Fontana is also convenient to the Tsali Recreation area with hiking and mountain biking. Take in the fantastic view of the pristine waters of Fontana Lake. Relax after a day of adventures in the bubbling hot tub. Morning View Over Lake Fontana is less than 10 minutes from the lake or white water rafting on the Nantahala River. Zip lining, mountain biking, and horse back riding are all less than 20 minutes from this cabin. Thank you so much for this beautiful experience. We really enjoyed our stay. It was our first time in the mountains and we will be back soon. Thank you so much for sharing your beautiful cabin with us. The view is amazing and the cabin is so cozy and comfortable a great vacation for us before back to school time. We hope to return soon. Thank you for sharing your beautiful cabin with us. We had a great time. The view is breathtaking from the cabin. All of the interior touches made it feel like home. We loved the area and will be back soon. Thank you for providing such a beautiful cabin to stay in. We had such a great time. The view is breath taking and the interior touches felt like home. we love the area and hope to come back when the leaves change. Prompt and professional.customer service oriented! Gorgeous Mountain View!!! Met every expectation and more. The cabin was decorated perfectly and the directions to get here were great. We had a great time here and will look forward to a return visit in the near future. Thank you for sharing your cabin with us! Beautiful view We enjoyed rafting and biking and lots of relaxation. Thank you for allowing us to visit this beautiful cabin. The view is absolutely breathtaking and the accommodations were amazing. Loved this cabin and we will be back very soon to enjoy it again. You have a beautiful cabin!! We have been coming to the Smoky Mountains for about 10 years now. We hope to come back again soon. The view was outstanding and the cabin was amazing. We loved the hot tub and the outdoor fireplace. Thank you for sharing this beautiful home. with us.